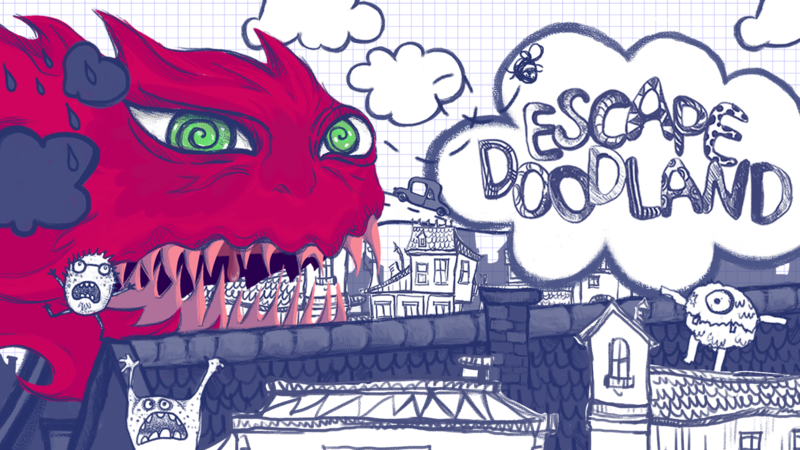 Escape Doodland, from developer from QubicGames, is an eccentric title and the first thing I noticed when just starting to play it was the quirky art style and music. Doodland looks like something you would see right out of a sketchbook and this design choice was a great one as it made the title stick out from all the other mindless endless-runners in all the right ways. Right when you start a level you’ll have an option to select either Hard or Harder, and this is because Escape Doodland is insane. In a way, it reminds me of Rayman, specifically Jungle Run, in that you have to make perfectly timed jumps in order to avoid disaster. The controls are very simple, and as a matter of fact, you’ll only need to use the d-pad and A button. Your character will automatically start running at the beginning of the level and this giant monster will start chasing you down, trying to eat you. The whole objective of Escape Doodland is exactly what the title implies, escape the troubled world and try to get to the end. Jumping is performed by pressing the A button to avoid various obstacles and pits. You can do a double-jump by simply pushing the jump button a second time while in the air. The monster can be slowed down if you think he’s getting too close to eat you by pressing left on the d-pad, releasing a fart in his face. No joke, farts are a big part of Escape Doodland and by pressing up you can perform what is called a ‘Farty Jump’ which will make you jump much higher than your normal jump. Also, if you press right on the d-pad you can perform a ‘Farty Dash’ to propel yourself further in the stage and away from harm. Both types of farts are key to getting out of tricky situations and will need to be mastered to even have a chance of getting through the later levels. To pull off these special abilities you would need the help from matches, because these farts won’t kist light themselves on fire. Every stage has matches you can collect, oftentimes in harder to reach areas, and it’s important to collect these due to only having a limited amount. They can usually easily be found running through any of the ten different worlds, as well as objects that look like green beans. These are much more important to collect as they are used as currency for the shop. Inside the shop is where you can unlock more playable characters, buy boxes of matches if you’re running low, and upgrade your special abilities. You have three slots you can put your special abilities in, so it’s imperative to choose wisely. I recommend using one for an additional extra life because you’ll definitely need it with how difficult the stages are to get through. You can also unlock new worlds by collecting the green beans and this is the only way to progress further if you want to make it to the final stages. The green beans are used for more than just currency though. The more you collect in each level will determine the amount of gold you’ll get at the end of each world and you can get a max of three gold per world. It’s easy to miss these beans from time to time, so it’s important to remain diligent and grab as many as you can. However, this is easier said and done, as Escape Doodland gets extremely difficult. If you want more of a challenge after beating a world, you can play it again on a harder setting. If you can beat the level again you’ll get rewarded with another piece of gold, making it possible to actually getting four from each world instead of three. Sometimes there will be areas where you’ll be flying the entire time and during these levels, you cannot use any of your special abilities. Instead, you’ll be dodging anything that comes your way and adjusting your altitude by a touch of the jump button. I really felt like this was a good change-of-pace for the gameplay and helped keep things fresh. Some levels will also have you swim through water, but the gameplay mechanics are about the same as flying. As stated before, you will die a lot in Escape Doodland, but each death felt like my fault and didn’t feel too cheap. You will need to learn from your mistakes and master your abilities to their fullest in order to beat every level in the game. Repetition may settle in after dying for the umpteenth time, but I never became too frustrated and enjoyed most of my time playing. Overall, Escape Doodland is a wonderfully unique and original take on fast-paced platformers and endless runners in general. The art style was captivating and music was appropriately satisfying. While the story is nothing special and the intense difficulty can be off-putting to some, Escape Doodland comes highly recommended for anyone looking for a fresh platforming challenge.